Let your avatar boost your interactivity and online sales! Easy integration. Just copy and paste an embed code to your web site footer. Compatible with all kind of web sites including WordPress, Joomla etc. Use different messages for each page. You can use Avazilla on up to 10 different domains with only one account. You can publish messages up to 1000 pages for each domain. Muted speech balloons do not irritate your web site’s visitors. 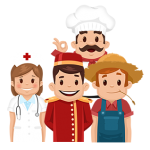 Unlike live support software our avatars do not require any staffing or overseeing by humans. Ability to enable/disable view on mobile devices. Ability to use your own avatar. You determine the period of showing the message balloons. Best way of creating mutual effect on your visitors by leaving a long-lasting impact on their visual memory. Increases sales when it is used effectively. Use the power of our speech bubbles to tell people in an easily understandable way what your web site is about. Don’t let your visitors miss any detail. Handing over the unused credits to next month. You can extend your Avazilla use any time or buy new balloons when it is finished. 30 days free trial period without giving CC details. Try Avazilla and increase your sales. Get 1 Month Free. No Credit Card Required.